I have been to Sizzler twice in my life, both of which were complete disasters! I remember my grandparents taking my sisters and me to Sizzler when I was really young. I am not sure if it was before or after the meal, but I do remember throwing up on the sidewalk in front of the restaurant. The next time I went to Sizzler was my junior year in high school. I was asked to a dance by someone other than who I wanted to go with. He was so, so nice but it was a very awkward situation. While sitting quietly and uncomfortably at my table, I look out the window to see my Mom and a few of my sisters spying on me! Literally peeking in the window and laughing uncontrollably! They seemed to think it was hilarious that I was on this date and had to come witness how uncomfortable I looked for themselves. 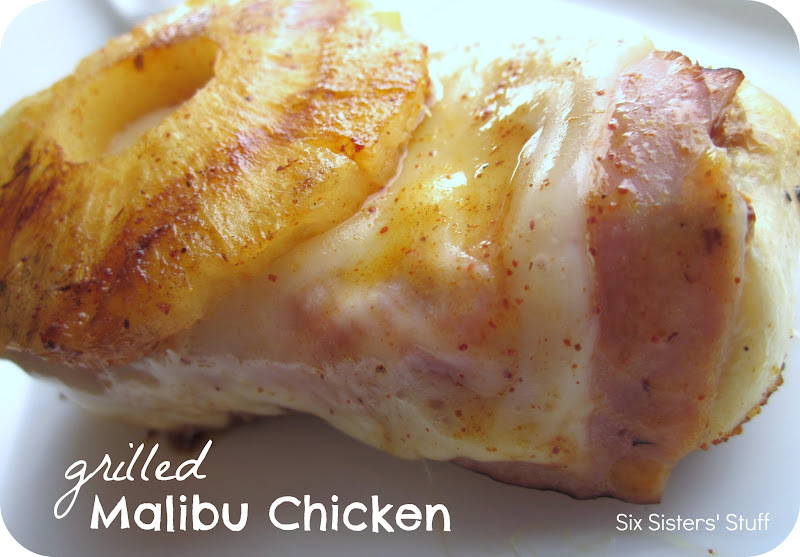 I don’t know if I can muster up the courage for another trip to Sizzler anytime soon, so I thought we would try to make a version of their Malibu Chicken at home. We love grilled chicken and this is one of our favorite recipes. The chicken breasts are marinated in a dry rub, smothered in a pineapple mustard sauce and topped with ham, swiss cheese and a pineapple ring. You can serve on a plate or on a bun for a delicious sandwich! Put one chicken breast in a gallon zip-top bag and pound it until the entire breast is uniform in thickness, then move to a platter or rimmed sheet pan. Repeat with the remaining chicken breasts. Season both sides of each chicken breast with the BBQ seasoning, cover and refrigerate at least an hour. Combine the sauce ingredients (butter, pineapple juice, mustard, honey, molasses, Worcestershire sauce and chili powder) in a medium mixing bowl and whisk until smooth, then set aside. Grill one side of each chicken breast and each pineapple ring over direct heat until they are seared and have nice grill marks, about 2 minutes. Flip each chicken breast and ring, brush with the sauce, and cook another two minutes. Move the chicken to the indirect part of the grill and brush the top of each with the sauce. Top each breast with two slices of ham and drizzle the ham with the sauce. Put a slice of cheese then a pineapple ring on each breast and drizzle again with the sauce. Continue cooking with the grill lid down until the internal temperature reaches 160º, about 10 minutes. Oh my this looks yummy. PINNED! This looks delicious. I need to find something to spice up our meals. Thanks for visiting Pounds4Pennies this week. Stop by to LINK up this great recipe! Oh my goodness! That looks so good! I'll be adding this to my menu for next week for sure!! This look divine :) And I already have most of these ingredients :) Making next week. So I am not the only one who had a bad experience with throwing up after eating at Sizzler. Definitely going to pin this one! I worked at a Sizzler thru my high school years! We still make a version of Malibu Chicken for our family meals, but I like the idea of your grilled version! Thanks for sharing! WOW! This was wonderful. My youngest who rarely finishes any of her dinner said, "Mom I have just one thing to say, YUM!!!" I have made this recipe two times...my kids LOVE it..its soooo very good! The first time I made this I did not save the juice from the pineapple (I use fresh, much better to grill) and it was really good, and the 2nd time I made this I had the pineapple juice but not honey..and it was still good!!! Without the pineapple juice, the sauce was thicker and stuck to the chicken a bit better...but either way was still so VERY good! We do not have a grill, is this possible to make in the oven (I know it won't have the lovely grill flavor, but needs must). You could bake this in the oven. Grilling is a faster cooking time, so you will need to cook for longer and watch closely and make sure that the chicken is cooked through.